West Derham at West Dereham01553 763044work VillageWest Dereham is situated 4 miles east of Downham Market and 13 miles south of King’s Lynn. Situated on the edge of the Fens, it has a spacious feel and is well located for exploring the Fens and the Brecks. Situated on a hill at the edge of the village, St Andrew’s Church was first recorded in the tax roll of 1246. It is one of the 124 round-tower churches in Norfolk and is a fine example of a medieval church. It has a nave and chancel largely unchanged since the perpendicular windows were fitted in the 15th century. Prior to its construction there was a much smaller Saxon minster church of Saint Peter's which has now completely vanished. The remains are in the graveyard west of the Tower of St Andrew's. 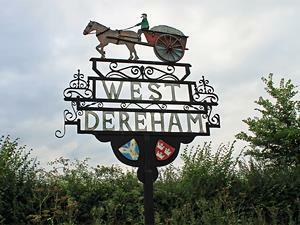 West Dereham is situated 4 miles east of Downham Market and 13 miles south of King’s Lynn. Situated on the edge of the Fens, it has a spacious feel and is well located for exploring the Fens and the Brecks. There are no remains of the abbey buildings today although signs of foundations and earthworks are visible as crop marks on aerial photographs.